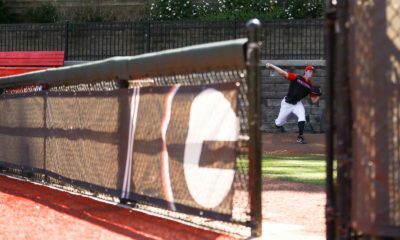 Behind eight shutout innings from freshman Robert Tyler and 13 hits offensively, Georgia posted a 6-1 win over No. 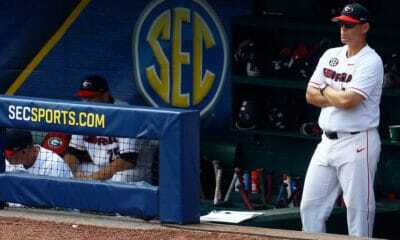 22 Texas A&M to clinch an SEC series Saturday at Foley Field. The Bulldogs improve to 16-11-1 overall and 3-4-1 in the SEC. Meanwhile, the Aggies drop to 17-11 overall and 3-5 in the league. Tyler (2-2) earned his second win of the season as he tied his career high of eight shutout innings, allowing seven hits with no walks and six strikeouts. The Cordele, Ga., native previously threw eight shutout innings versus Georgia Tech (March 4) and got a no decision as the Bulldogs rallied for a 1-0 walk-off victory in the ninth. Texas A&M’s Grayson Long (3-1) was tabbed with his first loss of the season, as he made his seventh start for the Aggies going four and one-third innings, allowing four runs on eight hits. He came in to the game having allowed just five runs in 39.2 innings this season with a 1.13 ERA. Georgia did most of their offensive damage in the fifth and sixth innings after jumping out to a first inning lead for the second time in as many days. Freshman Mike Bell had a career day with two RBIs and his first double as a Bulldog. Skyler Weber hit his first career triple to start the bottom of the fifth inning and junior Conor Welton also had career-best three RBIs. 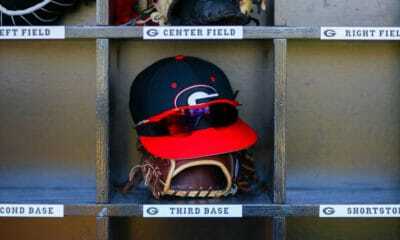 Georgia had their most profitable inning in the fifth scoring three runs on four hits, including two multi-base hits stretching their one-run lead to 4-0. Weber was the first run of the inning and led off with the aforementioned triple before Bell knocked him in with a single to right field. 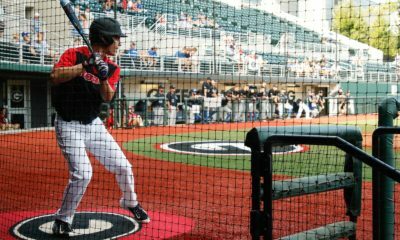 The final two runs of the inning came via upper classman bats as juniors Hunter Cole and Welton knocked in the third and fourth Georgia runs, respectively. Cole scorched a double to almost the exact spot as Bell advancing the freshman to third with one out and chasing Long from the game. Welton greeted A&M reliever Matt Kent with a sharp single up the middle scoring Bell and Cole expanding Georgia’s lead to 4-0. Georgia tacked on two more runs an inning later as they loaded the bases twice in the inning after designated hitter Zack Bowers started the inning off with a double off the left center field fence. The bases were loaded after Stephen Wrenn hit a solid single moving Bowers to third and Weber reached first on a sacrifice bunt and throwing error by Kent. Bell delivered his second RBI of the afternoon with an infield single to the shortstop to score Bowers and keep the bases packed for junior Jared Walsh. Walsh, who was in the lead-off hole for the second straight day, was hit in the back by an errant pitch bringing home Wrenn to make it 6-0. The Aggies would get one run back in the ninth as Jace Statum’s sacrifice fly was deep enough to score Blake Allemand from third off senior Dylan Cole. The series concludes Sunday with first pitch slated for 1 p.m.